As much as I was dazzled by Assassin's Creed Origins' incredible setting, I'm not sure the game made a compelling case for the series having a level-based progression system. Wandering into certain areas and being mauled by overpowered crocodiles actually made me feel less inclined to explore this incredible open world, which is the opposite of how I like to play this kind of game. I get why they did it. The levelling system provides essential structure and rewards that mean everything you do in Origins contributes to your progress in some way. My biggest problem is how it manifests in combat. Encounters with higher-level enemies in Origins are just frustrating. I would argue that the player doesn't have enough tools to perform effective crowd control, and one-on-one encounters produce plenty of cheap-feeling deaths. Unless enemies are within two or so levels of Bayek, it feels less like a test of skill and more like a death sentence where you're pelted with arrows and unblockable attacks. Plus, a stealth kill isn't always a stealth kill if Bayek isn't of a high enough level. 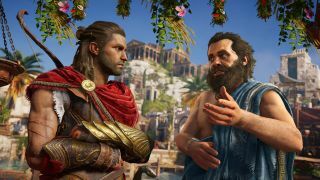 High-level regions are still a thing in Assassin's Creed Odyssey. I asked creative director Jonathan Dumont about it last month when I visited Ubisoft Quebec. "Regions have a level, when you come in—they have a level range. [Let's say] I'm level 10, and that region is 15-20. That one's going to be tough. A great player could probably burn through it, but if it's 10 or 15 levels above, you shouldn't try to complete the quests in that region. Although, the thing that we've changed, once you go past that threshold, the zone will scale up as well." He also adds: "We have some characters or targets and events, and you'll hit that gate a little bit." You shouldn't try and complete quests until your level is high enough that you actually stand a chance, then, which sounds pretty similar to Origins. I don't think it'll spoil the game, and I really enjoyed the last entry, but being discouraged from exploring certain regions until you hit an arbitrary number doesn't strike me as the best fit for a single-player open world game. I wish it was a little more flexible. In Origins, level requirements left a lot of room for filler. They provided so much structure that I didn't always feel in control of Bayek's journey through the game. I definitely found myself completing quests that I otherwise would've skipped entirely given the choice, just so I could reach the recommended level for the excellent main story assassinations. It's hard to tell how profoundly levels shape the game based on my four-or-so hours with Odyssey. When the protagonist Kassandra was level 22 and I went to fight a level 23 bear, the game warned me it was one level above me. The bear was tricky to kill, but then it was a bear. I also killed the demo's main target, a leader called Podarkes the Cruel, when Kassandra was level 20 and he was level 23. That one was pretty easy. My target showed up on the HUD with a red symbol, indicating that he was a threat, but I used some of the game's new abilities, like setting Kassandra's sword on fire, to take him down. Levels were prominent in the E3 demo, then, but it's too early to judge if completing side content will be as important as it was in Origins. In principle, though, I don't feel like 2017's Assassin's Creed really nailed level gating and progression. Odyssey brings interactive storytelling into the game for the first time, extending the notion of player choice, which has a lot of potential. But I'd also like the option to go anywhere and do anything without as much of a guided hand, especially when the world promises to be just as spectacular.